I’m starting early working at the plot – it’s so much cooler then and I have the place to myself until the early waterers drift in from about 7am. I have some amazing-looking brassicas from a friend – they make my seedlings look awfully scrawny! Finished sorting the trellis, which had come unattached, got the bricks laid out ready for making the bed and decided where the 2 tayberries and their posts will go – need to make sure that I still have enough access to the comfrey pipe given that I am also going to fan-train the quince so options for getting at it will be limited. The tayberries have been in small pots since I bought them last year at the Hampton Court Flower Show, and I am a bit surprised they have coped so well with neglect. 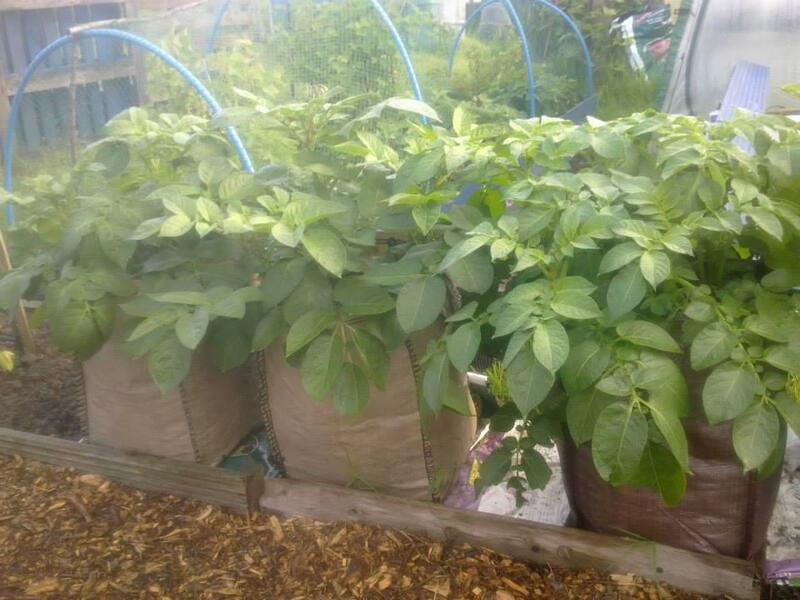 Spuds inna bag have become ENORMOUS plants – I’ve not had this result before and am really pleased. All are on the verge of flowering and have been in the bags for 8 weeks (9 for the Charlottes). The Desiree look like they will be first to flower. Not sure whether it’s worth earthing up more at this stage – I meant to put more compost in and they’ve caught me a little by surprise. The purple bed was finished off yesterday and is half planted with the Genovese courgettes, a tonda padana squash and a striped courgette. Not what I’d said I would put there: my memory is a little patchy! All my beetroot have vanished – either slugs hoovering off the tops or sparrows, who seem to love hoiking them out.